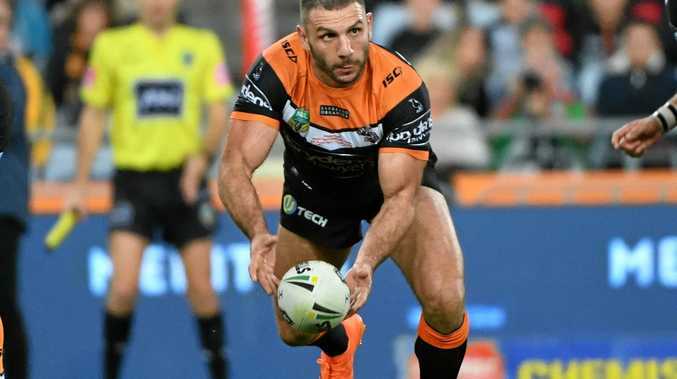 HAVING already gone through one Leichhardt Oval farewell, Robbie Farah isn't leaving any room for sentiment heading into what could be his final NRL match at the Wests Tigers' spiritual home. Already given a send-off at the ground two years ago, Farah has his eyes on the prize and breaking the Tigers' finals drought as they prepare to take on St George Illawarra on Saturday. One of the enduring images of the 2016 season was Farah sitting atop the Leichhardt scoreboard after being given a tribute by his longtime club before his subsequent departure to join South Sydney. His mid-season return to reunite with fellow club favourite Benji Marshall has played a big part in the Tigers' late season resurgence. which has them sitting two points outside the top eight. "I've had a farewell, I've had a return, I've had a first game back with Benji - it's like a farewell tour," Farah said. "It's just another game for me." Farah is still weighing up whether to draw the curtain on his 16-year career. After returning to the Tigers mid-season - following a year-and-a-half at the Rabbitohs - Farah has been instrumental in moving the side to within touching distance of their first finals campaign since 2011. The 34-year-old said he still felt fit enough to make it through another gruelling pre-season and his body wasn't letting him down. "Physically I'm fine," Farah said. "Being a footy player, you've got to want to put your body on the line week in and week out. And I think the day you stop doing that is probably the day you should give it away. "I know you're going to keep asking me, but to be honest I'm not in any rush to make a decision. Whether I make the decision today or in the off-season, that'll happen when it's ready."